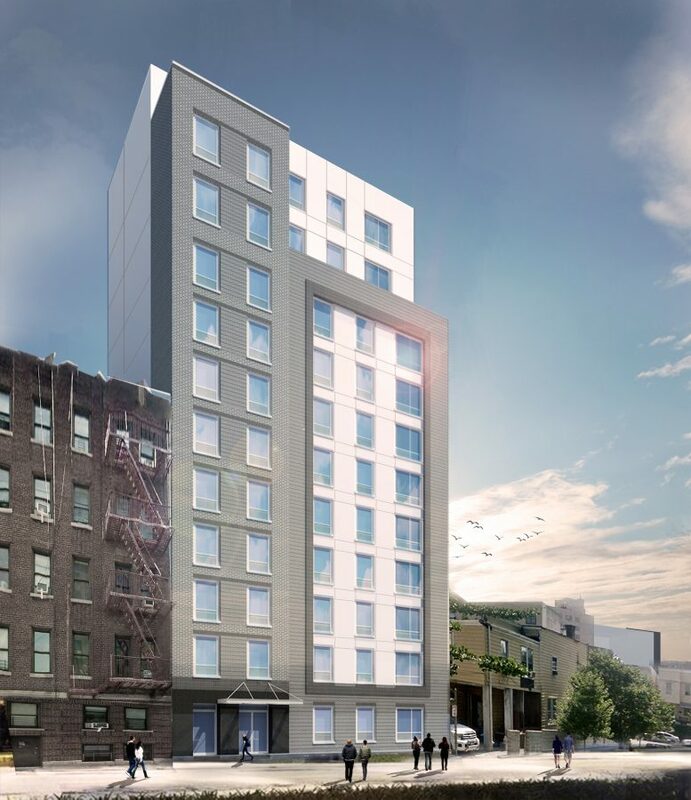 Last week, Thorobird Companies filed plans for three affordable rental buildings in the Bronx. Now YIMBY has a rendering for one of them, a 12-story development planned for 225 East 179th Street in the central Bronx neighborhood of Mount Hope. Designed by GF55 Partners, the building will be partially set back after the ninth floor and clad in a mix of white and gray facade panels. The 115-foot-tall structure will hold 37 apartments and 25,390 square feet of residential space, for a typical apartment measuring 686 square feet. Each floor will have two to four apartments, and tenants will be able to enjoy roof decks on the 10th and 12th floors. The development will also include a 225-square-foot backyard, plus a gym, laundry room and bike storage in the cellar. Thorobird, which is based in Midtown, picked up the property between Grand Concourse and Anthony Avenue for a million dollars in June. A late 19th century, three-story wood frame house occupies the 4,250-square-foot lot, and demolition permits have not yet been filed to knock it down. This building will join another 12-story project a block away at 220 East 178th Street, and a third building will rise a dozen blocks north in Fordham Heights. 3 Comments on "Revealed: 225 East 179th Street, Mount Hope Affordable Housing"
Can’t become less hot in the progress, on the best co-operation of 12-story development and apartments. Seems reasonable,however, what are affordable rents set at? Do they reflect the neighborhood per capita? Don’t be fooled by pretty renditions. At the end of the day, can neighborhood residents afford the apartments? Always ask questions…. I am a Caseworker in SE Bronx and always receiving requests for affordable housing information. Please provide details: i.e. application process; income limits; any senior specific housing. We thank you, in advance, for your assistance in this matter.